With its lavish hand-painted detailing, dreamy illusion neckline, and airy chapel train, this Monique Lhuillier gown (pictured above) is the essence of boho beach chic (price upon request at Divine Designs). On him, Topman’s gray fern-print skinny trouser ($120) and jacket ($280) give a subtle nod to the tropical locale, while Zara’s black V-neck ($17.90) is the essence of wear-it-again (and again) cool. Strike a pose in Claire Pettibone’s four seasons–inspired lace, silk, and tulle gown. The dramatically low neckline, waist-accenting lace and embroidery, and low, open back will have heads turning long after you say your “I Do’s” (price upon request, The English Dept). Think minimal jewelry to polish off the look—a pair of bracelets from Katie Waltman is all you need to create an understated elegance that keeps you and your gown the star of the show. Lisa McGuire, owner of Portland-based Crave Design, created this beachy paper suite with the waves of Tulum in mind. “The natural elements of the surrounding area are always an inspiration,” she says. 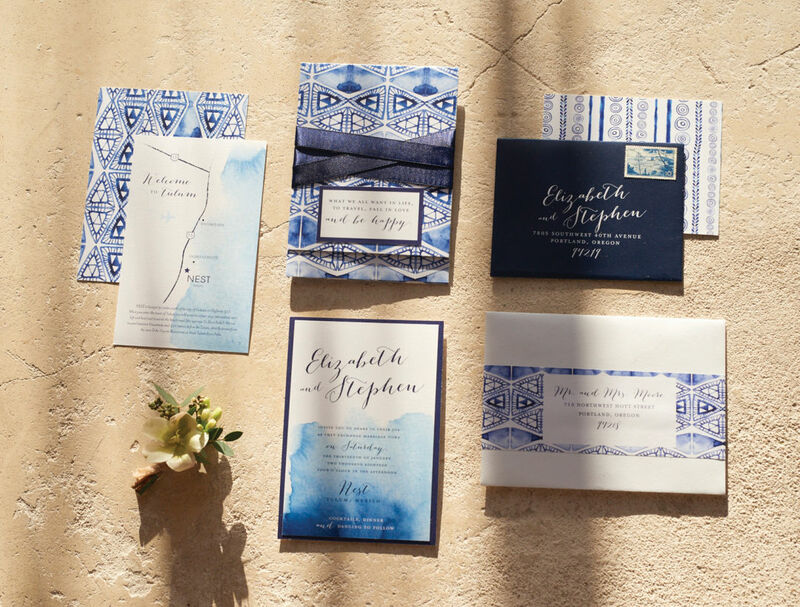 Mixing custom watercolor and indigo dip-dyed artwork alongside double satin ribbon and double-thick matte card stock, this suite, which includes the wedding invitation, RSVP with coordinating envelope, and map details, is rich in color and texture. “Watercolor designs have been popular the past few years and bring a soft, irregular feel to stationery,” Mc-Guire notes, “while mixing different patterns and textures can give guests a feel for the venue and cultural influences.” Boutonniere by Playa del Carmen-based Xochitl Botanicals. Put your inner goddess on outward display in this bohemian lace frock by Galia Lahav. Inspired by the works of Federico Fellini, this gown is layered with sheer pleated lace and hand-embroidered antique net. Its soft translucence offers a glimpse of the depth of layers and textures underneath, all while lending an airy lightness to the overall look (price upon request at The Dress Theory in Seattle). Katie Waltman’s large crystal studs with two-layer jacket round out the sublime look. Local designer Elizabeth Dye’s flirty gown is the essence of beach- (or vineyard- or park-) chic. Its linen underskirt helps give the dress a soft structure, while the sheer overlay brings a flowy movement to every step. We love it with Katie Waltman’s gold crescent pendant. Fresh florals from Moni Junco of Xochitl Botanicals in garden-fresh whites and greens give the entire look a truly organic feel. Nestled along Tulum’s famed coastline and tucked under a canopy of palm trees lies the luxury boutique hotel Nest. The intimate property showcases natural simplicity at its finest; the modern-minimalist Mexican aesthetic features sunbleached stone dwellings, wood and woven textures, and casual, tropical vibes. Nest has nine rooms that, all together, can sleep up to 22 people, some with ocean views and terraces, and an on-site restaurant and bar that serves up colorful Mexican-fusion cuisine, fresh fruit juices, and never-ending margaritas. The private, beachside setting is prime for destination weddings of up to 60 guests, as well as romantic honeymoons and unforgettable bachelor and bachelorette getaways. Want to rock a flirty crop top on your big day? Parisian designer Rime Arodaky’s ensemble strikes an edgy elegance with its crepe and embroidered tulle top and coordinating high-waisted crepe and embroidered tulle skirt (price upon request). Lush blooms from Xochitl Botanicals in wispy white and jungle greens bring an easy, ready-to-wed kind of vibe. Romance is in the air with Hayley Paige’s A-line organza gown. Intricate beading along the illusion neckline catches light with a soft shimmer, while the illusion back and playful slit add an air of whimsy (price upon request at Anna’s Bridal Boutique). Top off the look with elegantly understated gold hoops from Katie Waltman. And who says only brides can wear pink? Let your groom show his softer side in Topman’s rose dust jacket ($220) and Gap’s classic white V-neck ($17)—the Hook + Albert black lapel pin gives the look just the right amount of edge ($30 at Nordstrom). Looking for that one-of-a-kind wedding find? Etsy shop Salt of the Rocks specializes in both handmade bridal wear and vintage pieces, including this glimmery gold gown. Bedazzled with metallic sequins and beads, and with an oh-la-la translucence, it’s just the ensemble for statement-making brides ($380). Gold tassel earrings from Katie Waltman polish it off with the perfect pop of retro-glam. Local designer Claire La Faye’s penchants for the über-feminine is on glorious display in this gold-sequined A-line number. Fitted through the bodice with a low V-neck front and plunging back, it opens to a full, cascading skirt that brings a breezy brightness to every step (price upon request at The English Dept).